We’d love your help. Let us know what’s wrong with this preview of Ghost of the Frost Giant King by Morgon Newquist. On a continent where only the southernmost tip sees all four seasons and gods still freely roam among men, the giants are awakening from their long slumber in the mountains. As towns along the great Thòrsà River are destroyed, political relations between the two human nations, Jötunheim and Midgard, are more strained than ever. War is coming in the lands of men as autumn c On a continent where only the southernmost tip sees all four seasons and gods still freely roam among men, the giants are awakening from their long slumber in the mountains. As towns along the great Thòrsà River are destroyed, political relations between the two human nations, Jötunheim and Midgard, are more strained than ever. War is coming in the lands of men as autumn comes to an end. With the coming of winter the Frost Giants will become more powerful and feared than before. A party of adventurers sets forth to find a legendary horn that is rumored to weaken all giants in the area of its trumpet. They will climb deep into the mountains in an effort to drive back the giants before they wage war on all of Thrúdheim — and its gods as well. An adventure supplement for the D20 Game System, 3.5 edition rules. 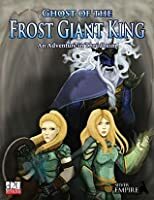 To ask other readers questions about Ghost of the Frost Giant King, please sign up. I won this book on goodreads. along with the dice play. She is an avid fan of fantas Morgon Newquist started life by causing an international incident in Central America, and has been marching to the beat of her own drummer ever since. She grew up in the Rocket City - Huntsville, Alabama. After a stint at the University of Georgia to study Latin, she has returned to the place of her upbringing where she wrangles two dogs, a cat, and four children daily.